Congratulations on taking the all-important first steps in purchasing your new best recurve bow. Archery is seeing an increase in popularity these days with films and movies showing the pleasures associated with target practice. But your choice in a good bow will depend on much more than just the pleasure – there is a science associated with selecting one that meets your needs. What is your budget? Usually, a higher budget will yield a higher quality product, but you should not spend more than you can afford. Be realistic with your expectations and do not expect a bow that falls under $100* to perform as well as one that falls around the $500 price range. How experienced are you? The best bow for beginners will be much different than one more suited to the intermediate hunter or target shooter. What accessories are included with your kit? Sometimes the less expensive option may end up being more expensive in the long run if you have to purchase your accessories separately, so choose wisely. What draw weight do you need? Generally, it’s best to go with the highest draw weight that you can comfortably handle. If you cannot hold the bow fully open for a full minute, the draw weight is too high. If there seems to be no resistance, the draw weight is too low and you are not using your full potential. Many bows are adjustable, making this an easier issue to work around. Will you be hunting or just doing target practice? Nearly any bow will work for target practice, as long as it is properly suited to your size and your arm span. Not all bows are good for hunting, though, and you will need to ensure you choose one that can handle killing an animal. Additionally, a bow that makes a lot of noise is probably not a good choice for hunting, as it will scare the animal away. Do you need a left hand bow? There are differences between left-handed equipment and right-handed equipment, and while this may seem like a minor consideration, it is vital. It’s important to realize that “left hand” with bows is not the same as left handed with other things – the important factor being your dominant eye (this is what you should lead with). Now that we have discussed the most basic questions surrounding your choice of bows, let’s move on to the fun part – the recurve bows! When choosing a bow for the younger generation, it’s important to realize that their arm span is not what an adult’s would be, and as such they will need a smaller bow. The Spirit Jr is just that – a smaller version of the popular SAS Spirit (which we will detail later in this post). There are many different draw weights available with this particular bow, which makes it important to determine what the recipient’s individual needs will be. There are five different options in regards to the draw weight, and all fell under $100 at the time this article was written. 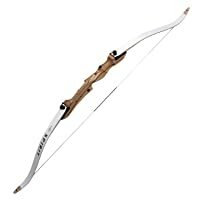 This bow is made from a strong fiberglass with maple laminations, which means it is incredibly durable, but still flexible enough to get your child interested in the fun hobby that is archery. This particular item is just a bow – not a kit – and there are no instructions included, so it’s best if you know what you’re doing. Assembly is fairly simple as long as you have experience setting up this type of bow. If you don’t have prior experience, it’s best to have someone teach you, as it’s not a self-explanatory process. It does lose some points for not including the instructions. Once you’ve got this set up, the experience is great for right-handed beginners. It is best if your child receives training (either an archery class or an experienced person to help them along the way), but aside from assembly and selecting the correct equipment to go with it, there is not much that needs explaining. 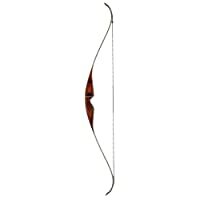 We have found no better bow for young or smaller beginners than this Spirit Jr 54″ Beginner Youth Bow. The instructions for this bow receive a bit of a backlash from customers, and we would like to reiterate that it is always best to take your bow to someone experienced – trying to set up a bow without proper instructions can be dangerous (if you were to set it up incorrectly and try to use it in the field) or, at the very least, frustrating. This is definitely no exception. If you want it done right, take it to someone who knows. A few customers reported that they had issues with attaching their accessories as well, which can be a bit of a problem if you are trying to install without anticipating these issues. However, in most cases, a bit of epoxy can help you if you intend to permanently install your accessories – this is best done before you leave on your hunting trip (as you should always ensure that your equipment is ready before you try to take it out). Overall, falling just under $100, this bow is as expected. It’s nothing fancy, but it should be more than sufficient for the beginner, as long as you ensure you have properly set it up and you are willing to do the necessary work to learn the craft. It might not be enough to take down a bear or a deer, but the beginning target shooter will love the SAS Spirit Take Down. For just a few dollars more than the SAS Spirit, this Raging River Zombow has an outstanding 100% customer satisfaction rating (at the time of this article). 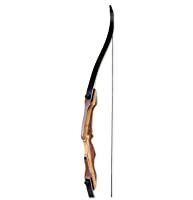 It is not well suited for hunting, as the experienced hunter will likely prefer a compound bow for such activities, but for target shooting and getting into the archery hobby this bow is a top-notch purchase at a bargain price. It does not include any accessories, but it leaves plenty of room in the budget to purchase those separately. 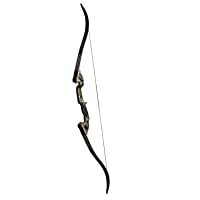 This bow is incredibly quiet, and cosmetically beautiful (although customers reported receiving white limbs, as opposed to the black shown in the picture on Amazon). There are no frills here, and like we have seen with the other bows on our list, no instructions were included – so it’s best if you have some understanding of what your bow should look like when it’s properly set up. The 40-lb. draw may be a bit heavy for some beginners, but with practice this bow could last you years. The accuracy is great with this one, as many novice customers reported being able to hit a 4-inch circle within just a few sessions of practice. It’s quiet, precise, and strong. This is definitely not a toy, and it’s not intended for use by children, but for the new adult, the Raging River Zombow is a steal for the price. Those with more experience bow hunting and target shooting will recognize the Samick name as one of the brands that is synonymous with high-quality equipment. This Samick Sage is no exception – this bow is one of the quintessential pieces of bow hunting equipment, particularly for the beginner. One of the benefits of using a takedown bow (as opposed to other types) is that you can easily upgrade it as your skill improves, and as such it’s best if you start with a lower draw weight if you’re still new. It’s cheaper to replace the limbs than it is to replace the whole bow, and if you start too high you may end up regretting your purchase – which means you’ll never use it, and you will have wasted your money. That being said, this particular bow is an excellent choice in terms of a lifelong purchase. It may be a little more expensive than the bows we’ve read through so far, but Samick has a reputation for quality bows (but be advised that this reputation is not as often seen on their accessories). With the ability to change out your limbs when your experience improves (or if you intend to pass it along to someone else eventually) and the ease of use, this is definitely worth the price paid. The Samick Sage also represents the least expensive option for bow hunting, assuming you purchase limbs of a sufficient draw weight to kill the animal you’re after. (Lower draw weight means easier pull, but less power.) For those who are just starting to transition from target practice to steady hunting, this is a wonderful choice that will last you many years. If you’re looking to get the most out of your money, it probably comes as no surprise that the best way to do that is to allow for a higher budget. Sure, less expensive bows are nice for beginners – but what if you already know what you’re doing and you’re looking for something that can keep up? The Martin Jaguar is a great choice for the intermediate archer, and this bow offers an unrivaled experience in its price range. Unlike many of the bows on our list, this particular model includes an owner’s manual – which is less necessary since it’s targeted for the more advanced user. Yes, Martin Archery has designed this to fill the voids in your bow hunting experience, while still offering a reasonable price and excellent customer service. This means that their instructions will assume that you already have a basic understanding of what you’re doing and only need a gentle reminder. Unfortunately, this bow does have some issues in terms of quality control, but if you don’t mind the idea of having to send parts back to be replaced, the company will replace defective parts for free as long as you have not tried to fix them on your own (as this will void the warranty). Generally speaking, you shouldn’t try to fix it yourself unless you know what you’re doing – so buyers beware. All in all, for those who know what they’re doing, this bow is a great choice – but it will probably require a bit of work to get it tuned exactly how you like. The Martin Jaguar is a wonderful choice if you are looking for a project piece that will also work without any upgrades. Bear Archery is one of the top-of-the-line bow manufacturers in the United States, and their higher price is backed up by an incredibly high customer satisfaction. You will be paying more from the start with this bow, but the extra cost is directly reflected in the quality you receive. At the time of this review, this particular bow was priced between $400 and $500 (give or take) depending on the draw weight you choose. This bow has an overall 4.9-star rating, which is unprecedented and unrivaled. One of the most impressive things about this particular bow is that it has been largely unchanged for the past 50 years – because the design works. It is not a takedown bow like the others on our list, so you won’t be able to replace the limbs, but with the satisfaction this thing provides, you won’t have to. Many users are still using their Bear Archery Grizzly almost 50 years after purchasing it, and they still love it as much as they did on day one. The price tag might seem a little steep, but this is one area you should splurge if you can afford to. You won’t have as many pieces to put together (just have it strung), you won’t have to fiddle with returns, you will simply be satisfied by the quality of your shooting experience. This is definitely the best bow on the market today, and its customers will happily back it up every step of the way. Whether you’re a beginner or a seasoned pro, the Bear Archery Grizzly Recurve is the standard of excellence among all recurve bows. Take the plunge and order this one – you won’t regret it! Hope you will be f9.